Today, when you order "THR-U - By Matt Pilcher", you'll instantly be emailed a Penguin Magic gift certificate. You can spend it on anything you like at Penguin, just like cash. Just complete your order as normal, and within seconds you'll get an email with your gift certificate. Effect - You pass a coin from your hand into a closed tic-tac box in an INSTANT! THEN you take a second tic-tac box and again in an INSTANT you pass the coin from the first box to the second. Easy to do and extremely VISUAL! - Passing a coin through a solid object is great, but it usually stops there. 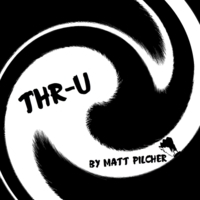 With THR-U you pass a coin through a solid object, then make it pass from that solid object into another.